Who Will Win the 2nd Semi-Final Match, Between BIJ vs HT and Toss Prediction? Where Can You Watch the Live Streaming of BIJ vs HT, 2nd Semi-Final or Channels to Watch? 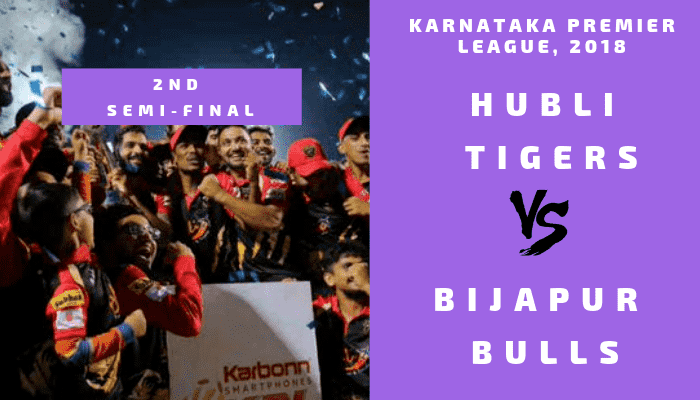 Hubli Tigers is all set to take on Bijapur Bulls in the 2nd Semi-Final match of Karnataka Premier League, 2018 on Wednesday, September 05, 2018. In Today’s Dream11 Fantasy Match Prediction of BIJ vs HT 2nd Semi-Final T20 KPL, 2018, we will cover Pitch Report of Srikantadatta Narasimha Raja Wadiyar Ground, Mysore, Toss Prediction, Probable Playing 11, Fantasy Cricket Tips, News and Updates, and Who Will Win? Hubli Tigers finished in the second position in the league phase with 9 points in their pocket. On the other hand, Bijapur Bulls finished in the third position in the points table with 8 points in their pocket. Hubli Tigers and Bijapur Bulls, both the teams have lost one game each in the league stage. According to our astrology prediction, HT will win. The team winning the toss should opt to bowl first as chasing is easy on this ground and setting a target can be a difficult task. According to our astrology prediction, BIJ will win the toss and they will invite HT to bat first. Date: The match will be played on the 5th of September 2018 (Wednesday). Match: Karnataka Premier League, 2018, HT vs BIJ, 2nd Semi-Final. Venue: Mysore, Srikantadatta Narasimha Raja Wadiyar Ground. Time: 01:00 PM GMT, 06:30 PM IST, 06:30 PM Local. The pitch will be good and will only favour the batsmen if they manage to play the first couple of overs without losing any wicket. The pitch will favour the bowlers, especially the fast bowlers. The spinners will also get some help from the wicket. Overall the bowlers will be benefited from the wicket. The spinners and the seamers both will get some extra help from the pitch. Cloudy, partly cloudy and mostly cloudy, this is how the weather is going to behave today. It will remain the same throughout the day. It is predicted to be a hot and humid day. There is no sign of rain today. The temperature is expected to be 26-Degree Celsius and the humidity to be 69% which may rise up 98%. If you are a Hubli Tigers fan then the statistics of last five matches may make you unhappy. Hubli Tigers has won one match out of five matches whereas Bijapur Bulls has won four games out of five games. In the last encounter, HT defeated BIJ by 4 wickets with 7 balls remaining. Mahesh Patel, IG Anil and Mohammed Taha were the key performers. Star Sports has all the exclusive rights to broadcast the live coverage of Karnataka Premier League 2018 (KPL) in India and its Subcontinent Countries like Bhutan, Nepal, Sri Lanka, Maldives, and Bangladesh. You can also watch the live match of Hubli Tigers vs Bijapur Bulls, 2nd Semi-Final T20 Match on Hotstar Digital Platform (Website and App). All the TV and OTT (Audio and other media services via the internet) rights for the tournament is taken by Star India. Mohammed Taha, Abhishek Reddy, Praveen Dubey, Vinay Kumar and Mahesh Patel are key players of Hubli Tigers Team. Vinay Kumar will lead the HT team. Mohammed Taha, Abhishek Reddy and Sujit N Gowda will lead the batting department and Mahesh Patel, Anil I G and Vinay Kumar will lead the bowling department. Hubli Tigers Team will go with their best eleven. Mahesh Patel will play an important role in the 2nd Semi-Final. Vinay Kumar (c), Mahesh Patel, Praveen Dubey, Sunil Kumar Jain, AM Kiran(wk), Sujit N Gowda, Abhishek Reddy, Mohammed Taha, Darshan MB, Kranthi Kumar, Anil I G.
Vinay Kumar (c), Ram Sarikh Yadav, Sunil Kumar Jain, Darshan MB, Mayank Agarwal, Vidyadhar Patil, Nitin Bhille, Vidhwath Kaverappa, Abhishek Sakuja, Shivraj S, Abhishek Reddy, AM Kiran (wk), Kranthi Kumar, Rahul Naik, Praveen Dubey, Sujit N Gowda, Mohammed Taha, Mahesh Patel, Anil I G, Parikshith Shetty, Suraj Seshadri. KP Appanna, KC Cariappa, Bharath Chipli, Mir Kaunain Abbas, and KN Bharath are the key players of Bijapur Bulls Team. Bharath Chipli will lead the BIJ team. Bharath Chipli, Mir Kaunain Abbas, and KN Bharath will lead the batting department and KP Appanna and KC Cariappa will lead the bowling department of BIJ. Bijapur Bulls Team will play with their best eleven. Mir Kaunain Abbas will play a key role for BIJ team. Ronit More may replace Suraj Kamath. Bharath Chipli (c), Suraj Kamath/Ronit More, KP Appanna, Naveen MG, Suneel Raju, Mir Kaunain Abbas, Shishir Bhavane, Bhavesh Gulecha, KC Cariappa, KL Shrijith (wk), KN Bharath. Bharath Chipli (c), KP Appanna, Majid Makkandar, Ronit More, Anurag Bajpai (wk), Suneel Raju, KN Bharath (wk), Shishir Bhavane, Bhavesh Gulecha, KC Cariappa, Rishabh Singh, Naveen MG, KL Shrijith, Mir Kaunain Abbas, Suraj Kamath, Zahoor Farooqui, Ruthraj, Amar Ghale. Crix11 Expert Choice for Captain and Vice-Captain are Mahesh Patel and Vinay Kumar respectively. Conclusion: This is it for Today’s Dream11 Fantasy Cricket Match Prediction of BIJ vs HT, 2nd Semi-Final T20 Match, which will be played on Wednesday 5th September. We have covered all the details required to win any fantasy leagues.